Over the years the Keillor House Gift Shop has developed products for our visitors, offering souvenirs, gift items and products that reflect our region and its history. In addition, from mid-June to mid-September, we offer a wide variety of products with new consignment items each season including handmade cards and wooden toys made by Westmorland Institution inmates. Every fall there are homemade jams and pickles for sale. The following are a few products that can be ordered on line. Keep us in mind when looking for a gift. All sales support our museums. Your item(s) will be mailed as soon as payment is received. 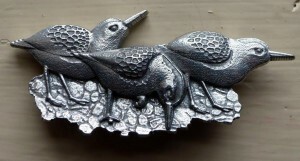 This beautiful pewter pin featuring sandpipers was designed by local artist Robert Lyons and produced by New Brunswick’s Aitken Pewter for our museum. Our area at the head of the Bay of Fundy receives visitors from around the world who come to see the semi-palmated sandpipers that migrate here each summer. Size 2 ¼ inches x 1 inch. This needlework kit was designed by Sheila Horseman specifically for Keillor House Museum. 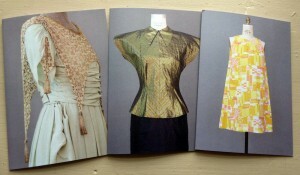 Sheila researched and wrote a series of articles for the magazine, Needle Pulling Thread in 2008 featuring some of the wonderful examples of needlework in the Keillor House Collection. 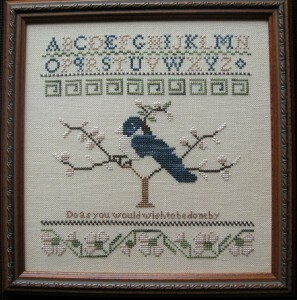 The design in this kit is a motif from Mary Keillor’s sampler (1837), an artifact on display at the museum. The kit includes pattern and wool. An apron was an important part of early kitchens and households and continues to be so today! 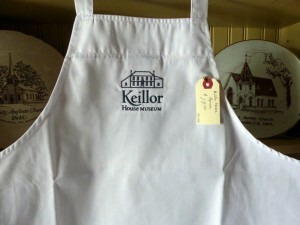 This is a classic chef’s apron of 65% polyester 35% cotton, embroidered with Keillor House logo. One size fits all. 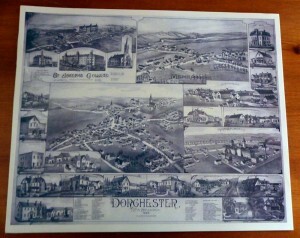 This charming historical map was printed in 1885 showing all the buildings in Dorchester as well as parts of Memramcook and the Dorchester Federal Penitentiary. 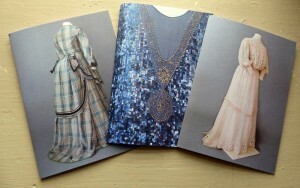 It has been reproduced in a smaller format 15 ¾ inches x 13 inches – suitable for framing. Almost too pretty to dry your dishes! 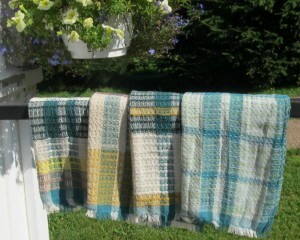 These beautiful hand woven cotton tea towels are made at the St James Textile Museum. If you come to visit, drop in and see them on the loom – each one is unique. Size of flat weave approx. 14 inches x 28 inches and waffle weave pattern approx. 16 inches x 32 inches.